What controls your heart, lungs and every other organ, cell and tissue in your body? If you guessed your brain, you’re right. But how does your brain tell all those important functions what they need to do, and when to do it? Your nervous system is responsible for that vital communication. This master control system has two modes: sympathetic, which causes your fight-or-flight instinct, and parasympathetic, which is the state where growth and healing occurs. When stress is present, it causes your sympathetic nervous system to take over and puts you into a state of imbalance. This state is especially significant for today’s children, and chronic sickness and frightening diagnoses from the medical doctor are often the result. 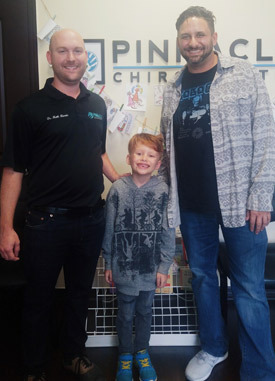 At Pinnacle Chiropractic, we offer solutions for ADHD, autism spectrum and chronic illnesses in Lakewood Ranch. With chiropractic care, your child’s parasympathetic nervous system is stimulated so that the balance is restored to their nervous system. When it functions optimally, their body will, too. Contact us today to find out more about enhancing your child’s well-being, naturally! We offer complimentary consultations that can be done by phone.